Did anyone else see the Living Social daily deal yesterday…for McDonalds? Half off Big Macs and large fries. I opened the email, gave it a quick eye roll, deleted it, and moved on. This was around 6am. Fast forward to 1:30pm when I’m sitting in Panera enjoying a bowl of chicken noodle soup, grabbing a bite to eat afer teaching and killing time before my oil change. Sitting alone, I naturally hop on my cell and peruse Facebook. Of course. On Facebook I see that Mr. Prevention had shared the Living Social daily deal on Facebook and made a comment, eluding to the fact that be purchased one of the deals (which was for 5 Big Macs and 5 large fries…for $13). What’s a wife and dietitian to do? After a brief moment of, “SERIOUSLY! ?” I did pause to be thankful for Mr. P’s willingness to try a lot of foods (he really liked a vegan quinoa soup I’ll share on Monday…I was so pleasantly surprised!). I think throwing a middle-America bred man into Europe and leaving him there for 2 years may have helped expand his palate. Thank you, Italy. These pancakes, however, he wouldn’t touch with a 10-foot pole. The man -hates- coconut (supposedly…except in Indian and Thai food — if he doesn’t know it’s in the dish…don’t get me started…). 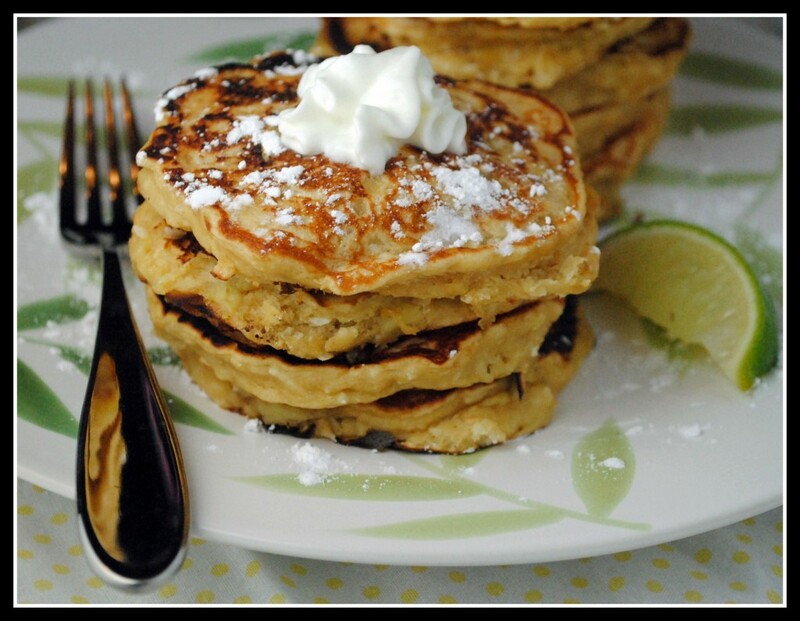 I must say, though, these pancakes should likely be renamed to “Coconut Banana Lime Pancakes” because the flavor of banana is very front and center, while the lime and coconut put their tropical spin on these not-so-ordinary flapjacks. 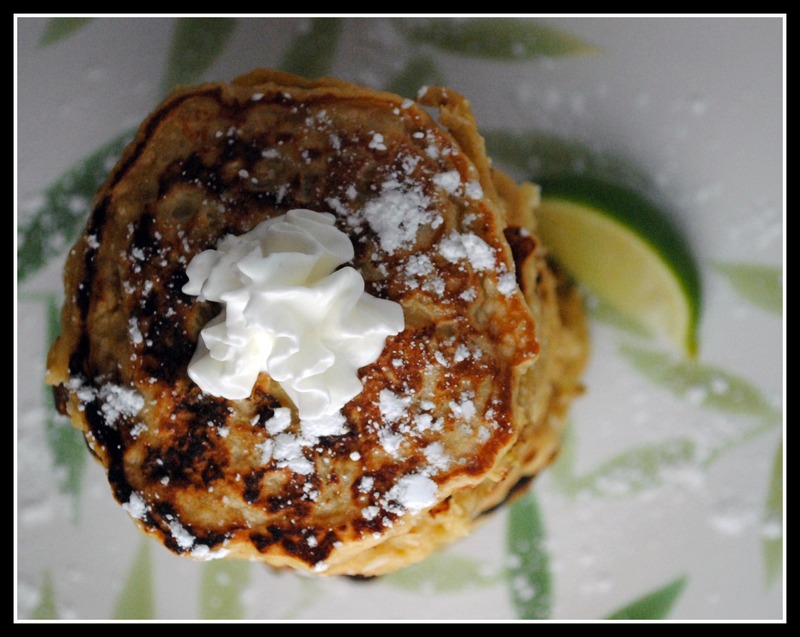 If you’re resisting the changes in weather, consider keeping things light and tropical in the way of these pancakes for a weekend breakfast. Or, just because coconut, banana, and lime make for a really great combo, mmhmmm. After the success of Whole Wheat Sour Cream Blueberry Pancakes, I was happy to see sour cream and Greek yogurt in this ingredient list, along with fiber-packed whole wheat pastry flour and oats. Heat a large non-stick frying pan over medium-high heat. Spray with non-stick spray. Add 4 scoops of the pancake mixture to the pan (about 1/4 cup each). Cook until browned on the bottom and bubbles begin to appear in the middle of the pancake. Flip the pancakes and cook for additional 1 to 2 minutes. Repeat with remaining batter. 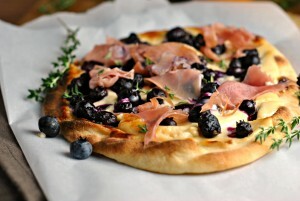 Serve immediately with desired toppings. Yield: 12 pancakes; 4 servings (3 pancakes each). 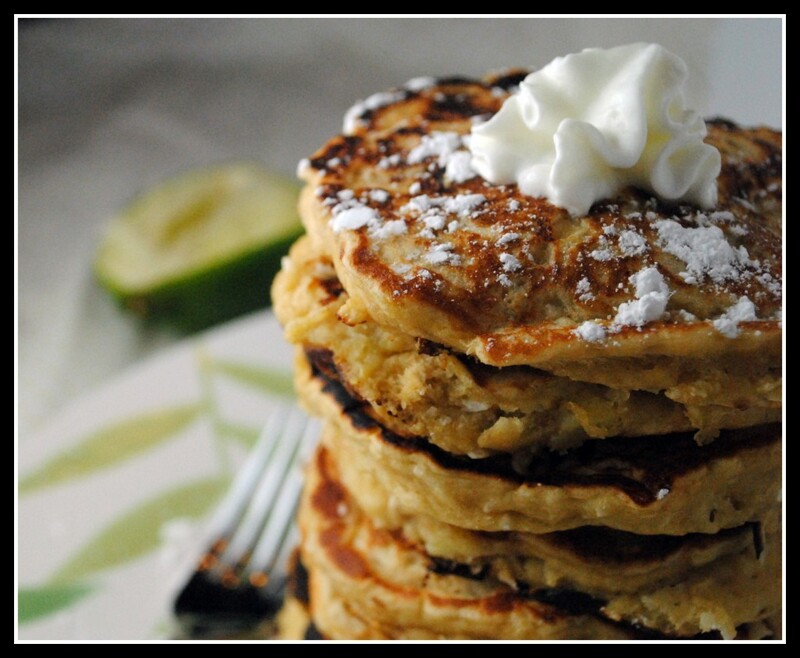 Result: Fiber-rich, coconut, lime, and banana pancakes. These are packed with natural sweetness and came out fluffy as any other. Simple to make and great for a healthy breakfast. Plus, they’re perfect for kids! Enjoy! What else to say other than TGIF? It sounds really good but I am not sure that it is a flavor that I want for breakfast! I would choose these over those golden arches EVERY day! Coconut and lime is definitely one of my favorite flavor combos! Last week we went to a Christmas Parade and Ronald McDonald was on a float. My daughter wanted to know who it was…I told her and now she thinks it is Old MacDonald (had a Farm). It actually made me happy to know she doesn’t know/care about the “Yellow M”. The pancakes look great! After seeing several of your posts lately, I think I’ll just make everything you make the day after you make it. YUM! I can only hope my future children are as care-free about things like fast food! 🙂 That’s wonderful! Buahahaha….I love hearing these stories between you and Mr. P. I’d love to be a fly on the wall and just listen the two of you banter back and forth. LOL. 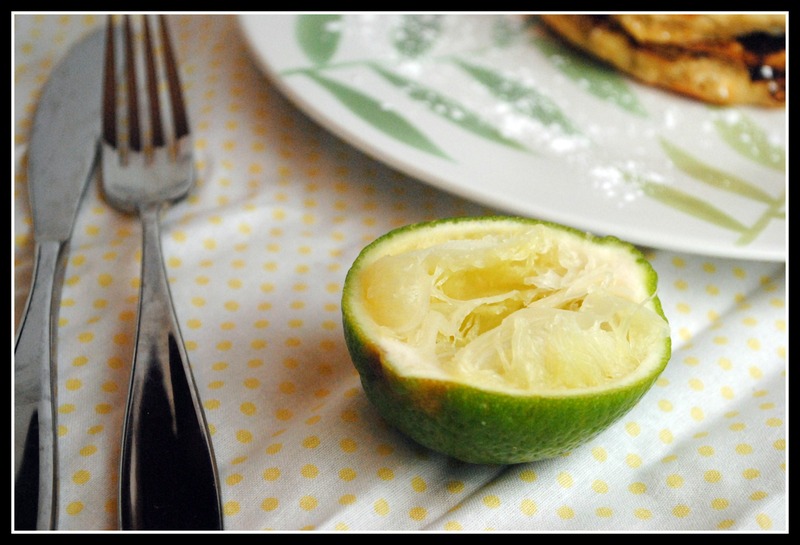 This sounds absolutely heavenly, and I was looking for a way to use up the limes that I have in my backyard. 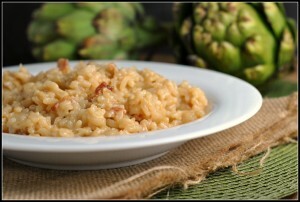 This is absolutely perfect for breakfast, my 2nd breakfast, lunch and dinner. (and the snack after I have dinner). Can you tell that I’m pregnant? LOL. We definitely banter. And it’s usually over dinner. SHOCKER. 5 Big Macs? Ummm . . . ick. What you should do, is make these again but don’t tell him there’s coconut in them. I would be very interested to see how that turns out. This story is pretty hysterical I must say!! Mr. Prevention cracks me up! I saw the deal too and thought, oh nice! Just what we need..to be selling deals on fast food. When it comes to men, I’ve not expanding palates doesn’t mean ANYTHING else we be removed from the palate. My husband will eat basically anything I cook, and love it. Working so much in China he’s opened up even more and (thank you sweet baby J) loves sushi now. But the man will still ask for Hamburger Helper on the regular and he eats fast food more than I care to know about for lunch. So, even though he’s expanding his palate, he still loves everything you used to. Hi Nicole. These look incredible. OMG…my husband is EXACTLY the same about coconut. If I told him there was coconut milk in my thai dishes, he’d gag. But he’s in the dark about that, and has seconds. Funny! Have a fantastic weekend. It’s like when I take the trash out and see Wendy’s bags smashed in the bottom of the trashcan, like Nick is trying to hide them from me. Come on now. But McDonald’s Big Macs are a whole other story! And he wouldn’t eat the pancakes?? I think Nick would eat two stacks of these, maybe three, but then again he is obsessed with coconut. I think the pancakes sound fantastic. Even though I’m not supposed to eat coconut, I would for these! HAve a nice weekend Nicole!